Hampstead Ponds has been a popular venue for a long time, though that is the wrong end of London for me. There was also Serpentine Lake in Hyde Park, but the swimming club banned wetsuits! Nowadays there are loads of places. With my wetsuit I have been to Royal Victoria Docks, Shepperton and Serpentine Lido. There are other places I have not got round to going to yet, but would like to - Diver's Cove near Merstham, and West Reservoir at Stoke Newington. The only thing is that at this time of year, as I found when I swam last Wednesday in the Docks, the water is that bit colder. That means that my body uses more energy to stay warm, and given that I am not a great swimmer I would rather use that energy to swim. So last Wednesday when I swam I got really tired, and even ended up wheezing for the rest of the evening and the following day. 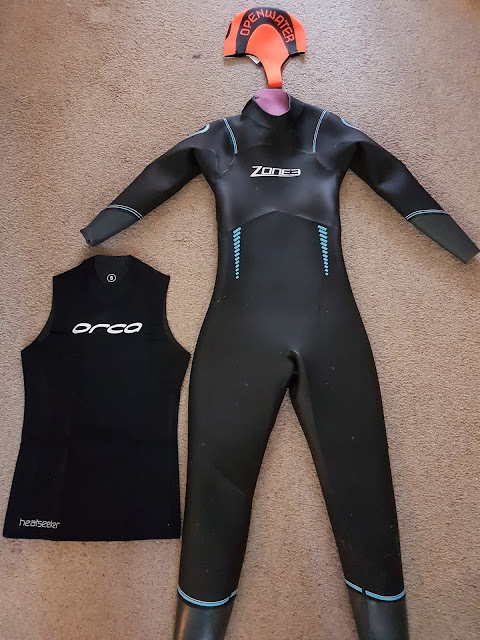 In an effort to avoid getting the same problem at Swim Serpentine I have ordered a a neoprene vest to wear under my wetsuit, and a neoprene hat to go underneath the official event swimming hat. It's not cheap - the vest cost around £45, and the hat cost £15. But I think it will be worthwhile for the next week, and it will even be useful for doing open water swimming during the winter months - something that I might be mad enough to do!